Fast turn-around analyses for small RNA-seq, microRNA-seq, single-cell small RNA, short total RNA sequencing data, and comparison of the user-given sequencing data to reference data from DASHR normal human tissues/cell types and human ENCODE cell lines. To get started, select and analyze a reference small RNA-seq dataset from ENCODE and DASHR or analyze your own small RNA dataset by uploading or providing a URL for web-accessible small RNA data. See tutorials for examples on how to use SPAR and prepare your data for analysis. August 23, 2018: DASHR v2.0 database has been released. 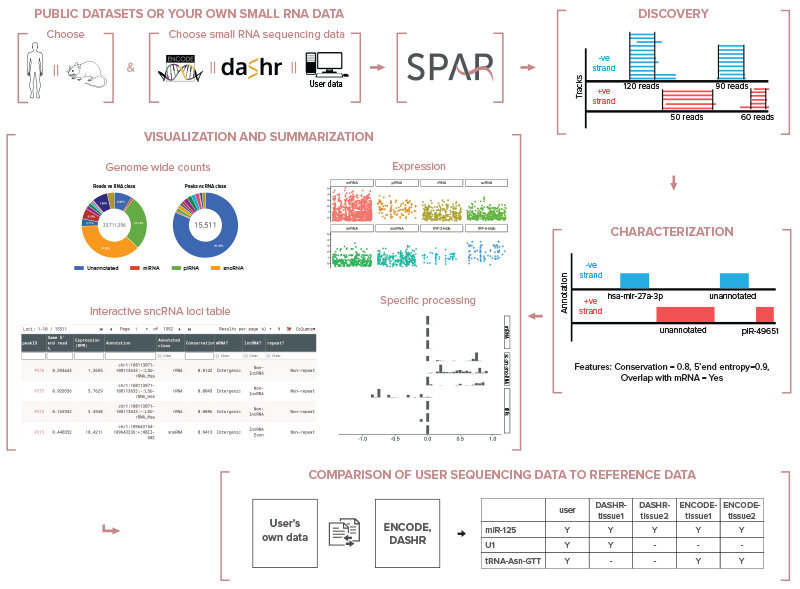 SPAR has been used to process all small RNA sequencing experiments integrated into DASHR v2.0 (>800 libraries across 185 tissues and cell types for both GRCh37/hg19 and GRCh38/hg38 genome assemblies).